A cup of ice cream in the middle of the night is certainly one of the best ways to celebrate a blog launch. At least, that's what I think and what I did – I'm weak when it comes to nut gelato. I've actually always dreamt of running a page where I could share about food and clothes, but every time I attempted to, I failed at finding real time and motivation for it. Still, I never gave up the idea but kept my supportive best friend always wait a little bit longer for this day to come. Then last summer, a friend reading the Instagram caption of my Kyoto trip post told me she felt like travelling with me through words. It really stroke me, and I thought it was the right time to seriously get into writing - I mean, on a more proper space called blog. After months of hesitation about its design and topics, seeking for a cool and catching name, the five words He Owes Me a Coffee popped out and I decided to finally embark myself on this new adventure. Reviewing all the lovely spots to go to with a buddy who appreciates nice food and nice drink became the main idea of this blog. From cute bakeries next door where we can get tasty pastries to unexpected great places miles away from home. Add some personal fashion posts to get inspired and lot of foodies' stories to make you hungry. You now certainly picture this lifestyle blog better than I make macarons (I don't know why I always mess them up). For my very first article, I couldn't leave you on this brief introduction. It would be like turning the TV off before Sherlock explains how he found everything out and that is not acceptable. 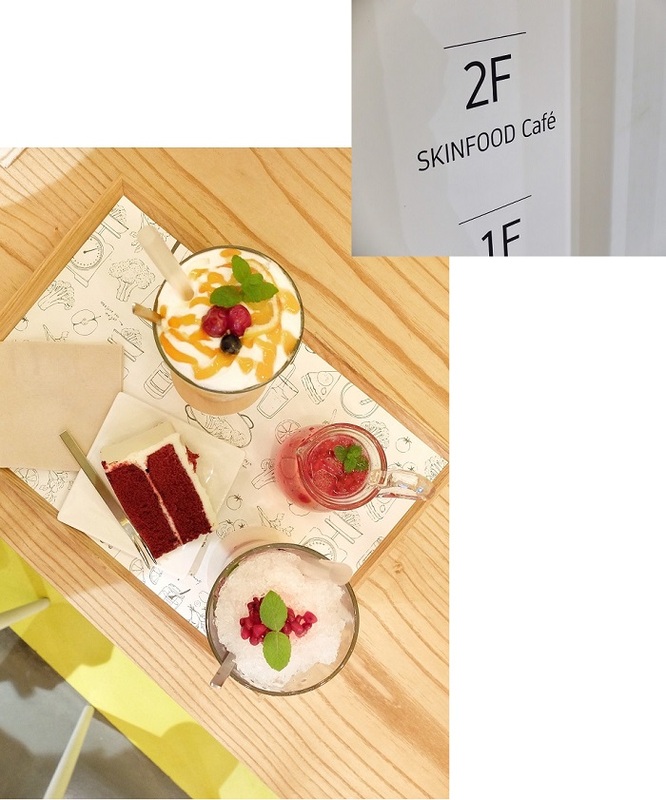 So let me tell you about this small but pleasant, luminous café I went to a few weeks ago. 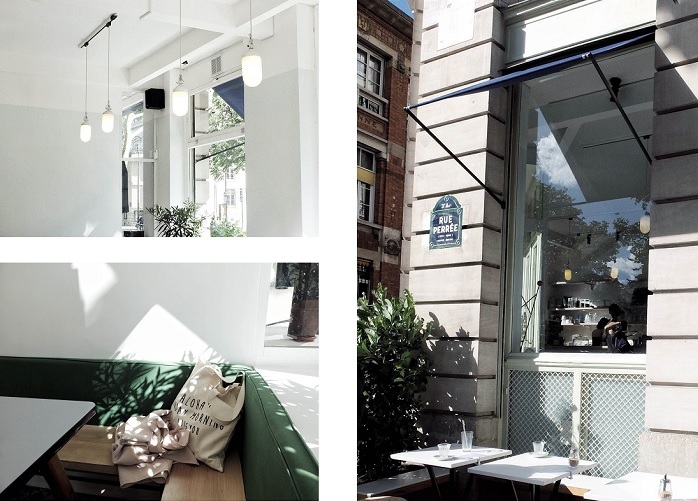 THE BROKEN ARM, located in Paris 3rd arrondissement, consist in a chic clothing store and a coffee shop / restaurant where you can enjoy treats, healthy lunches and refreshing drinks. 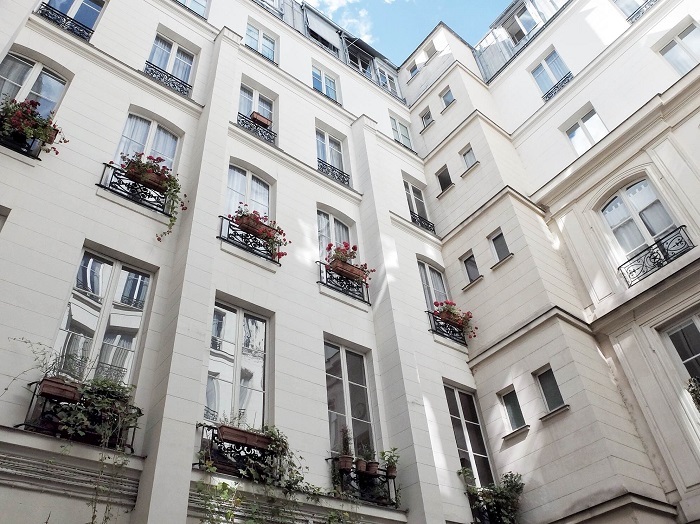 Less than five minutes walk from Temple station (metro line 3), it displays a long, white and clean facade, with chairs and tables on the terrace to sip your coffee outside. If google maps did not misguide you this far, cross the road to get closer. The lagoon blue hexagon-shaped logo with bold letters on it will indicate you're at the right place. 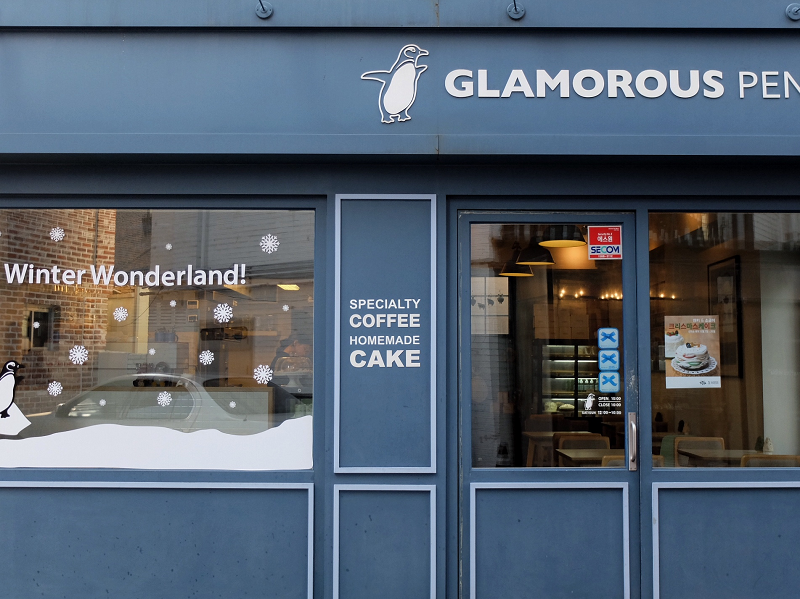 Pull the huge door and you'll see some mouthwatering cakes under a glass cover staring at you from the counter. On the left, you'll find the coffee basic menu written on a slate, and the changing juice / meal of the day is above baristas. 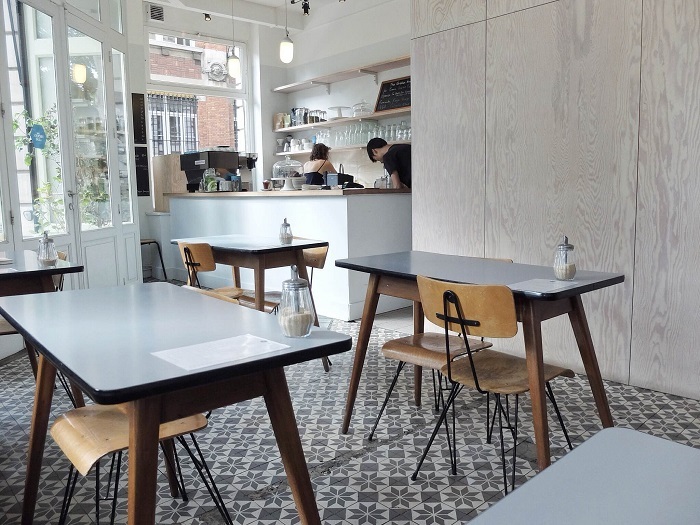 Pick a coffee or simply find an empty seat on the right to have a look at the breakfast or lunch menus. This is definitely a lovely and luminous space to cut out from Place de la République noisy crowds. As I often see friends having brunch there or some Instagramers posting about that famous poppy seed cake, I thought it was time for me to check this place out. The café was almost empty (we got in ten minutes before it closes and yes, we forgot to check the opening-closing hours) but we still had a seat on one corner. My friend went for an iced coffee to beat the heat and I took the juice of the day - apple, strawberry and watermelon. It was nice, not too sweet, made with fresh, raw fruits as I could taste remains of strawberry leaves. 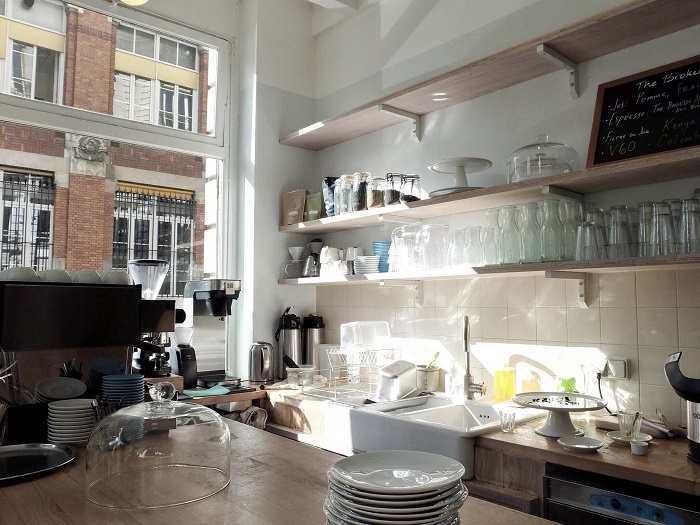 I had imagined the place being much more spacious, there are only about six tables indoor, but I was stroke by how beautifully the sun comes in through the windows and how it enlights the whole space. And I couldn't not add a note about the high ceiling and the suspended lights. I'll maybe go again to try the cakes or brunch course (do they have egg benedict?) but I'll make sure to go before the closing hour next time. it's never too late to have a muffin and a vanilla latte! I am proudly writting my very first comment on your blog, yeah ! it feels so good. I know how much this blog means to you and how much you put efforts in it. It's going to be full of you, what you like, your stories and so on and I can't wait reading everything ! And what a first article. The person who said we can travel through your words is right. You are certainly a good writer, I laughed more than once reading. The pictures too I love them, particularly the one with your bag and coat, the light and shadow are super cool !